Features: Hardcover, 238 pages, illustrations, full color. EXTRA MILES is not a prequel, sequel or remake of ORIZZONTI DI FORZA, Matteo Bittanti's study of the racing game genre published in November 2015 by Edizioni Unicopli. Rather, it is its ghost, its doppelganger. The book features twelve essays that expand, augment, and reshape Bittanti's road trips into the world of Forza Horizon and Forza Horizon 2. Accompanied by hundreds of illustrations in color, EXTRA MILES reaches new territories, pushing the boundaries of game studies. Extra Miles. 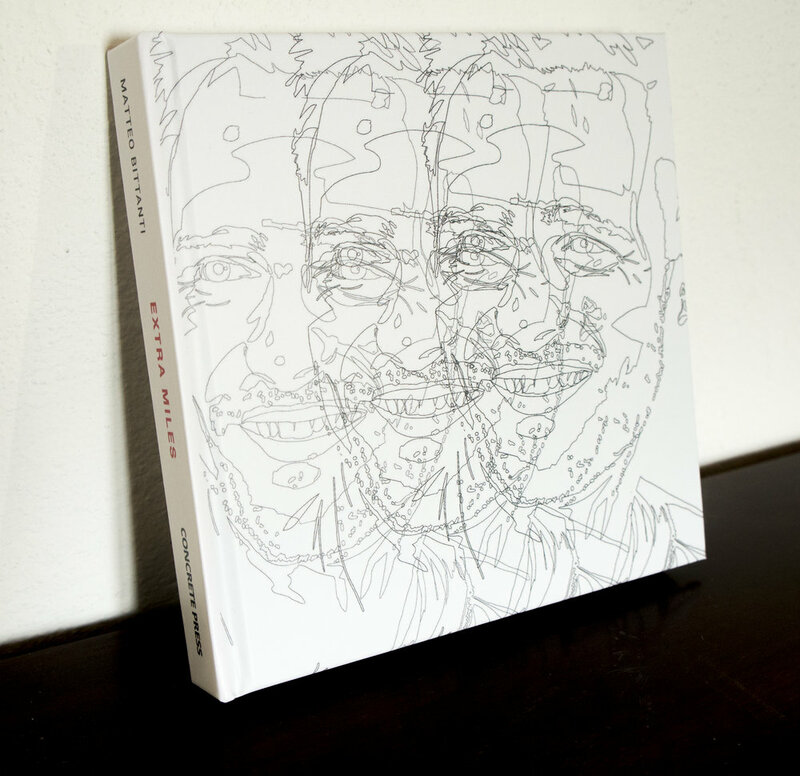 Estetica della guida videoludica is available in a limited edition of 100 copies. Matteo Bittanti is an interdisciplinary artist based in San Francisco and Milan. His work lies at the intersection of videogames, toys, cinema, and the web. Bittanti's conceptual pieces have been presented in the United States, Canada, England, Australia, Mexico, Scotland, Australia, France, and Italy. Since 2012, he has been collaborating with Colleen Flaherty as COLL.EO. As a scholar, he conducted fearless research at UC Berkeley, fought technological determinism at Stanford University, understood the difference between critical theory and hypocritical theory, social practice and social justice as an Adjunct Professor at California College of the Arts. Random Parts is an artist collective located in the Bay Area. In its current iteration, the group is a dynamic duo comprising painters Juan-Carlos Quintana and Colleen Flaherty. Established in 2013 with the aid of another painter, Carlo Ricafort, Random Parts has been collaborating with Concrete Press on several projects. To celebrate the release of Matteo Bittanti’s EXTRA MILES. Estetica della guida videoludica (EXTRA MILES. Aesthetics of Simulated Driving), the first book in Italian by Concrete Press, Random Parts spoke to the author about the joys of driving, writing, and playing. This interview is also available in Italian on LUDOLOGICA. Random Parts (RP): You wrote not one, but two books on racing games. Why? After all, racing games are mostly ignored within the context of games studies. Matteo Bittanti (MB): Exactly. This inexplicable lack, this unforgivable omission, is significant since the racing game is one of the most interesting and complex videogame genres, both ludically and ideologically. This hermeneutical myopia can be attributed to scholars’ blind acceptance of the genre’s “realism”: I decided to take it for a critical test drive, so to speak. In this naive view - supported by the game industry’s rhetoric, the racing game is regarded as a faithful replica of motorized driving in a purely agonistic context. But as I tried to demonstrate in my books, there is very little realistic in a racing game. Paraphrasing Slavoj Žižek (and Jerry Seinfeld, for that matter), the kind of realism that we encounter in a racing game is “realism without realism”. Through a careful examination of Forza Horizon one can fully grasp what John Urry calls “automobility”, i.e. the hegemonic ideology of private transportation in capitalist societies. The game - a playful, interactive (or rather, interpassive) simulation of such ideology - is a litmus test of the contemporary. RP: What is the relationship between Orizzonti di Forza and EXTRA MILES? MB: Both books provide plenty of insights on the theme of virtual, simulated driving. EXTRA MILES is not a sequel, a prequel or a remake of Orizzonti di Forza. Phenomenology of Ludic Driving. It’s not even comparable to a literary DLC, like the “Storm Island” expansion for Forza Horizon 2. If anything, it is Orizzonti di Forza’s ghost. In gaming jargon, a “ghost” is a feature of time attack mode or time trial mode which recontextualizes on screen a previous performance, usually the best performance, the one to beat. For example, in a racing game, the silhouette of a transparent vehicle repeats the moves made by a player in a previous session. In a sense, the ghost introduces a replay in real time, presentifying a past experience. Orizzonti di Forza is the ghost of EXTRA MILES because, in many ways, Concrete Press’ book surpasses its predecessor. But at the same time, EXTRA MILES is the ghost of ORIZZONTI DI FORZA, its doppelganger. It’s unclear which one is following and leading. After all, they are trading the same waters, or rather, driving on the same circuit. Their complex relationship is visually communicated through their cover jackets, both depicting Playground Games’ Creative Director Ralph Fulton by Mauro Ceolin aka rgbproject. Like a transparent ghost, the portrait gracing EXTRA MILES’ cover is phantasmatic, elusive, and transient. RP: Does this mean that the two books must be read together, in a sequence? MB: Yes and no. They are stand-alone books, and yet, at the same time, they reference, expand, and complement each other. In fact, several of the key concepts introduced in Orizzonti di Forza are further discussed in EXTRA MILES. The former is purely textual, while the latter is accompanied by hundreds of illustrations. After all, topics like game photography practically mandate a visual supplement. Likewise, the discussion on drivatar theory which focuses on the future of human drivers (i.e. they will be automated out of existence) has been augmented through the use of images. RP: Can you describe your writing process ? MB: I designed the two books together. Overall, the project took five years, as my first Game Art projects discussed in the book date back to 2009. Formally, Orizzonti di Forza and EXTRA MILES share the same two-part structure, AMERICA and ITALY, reflecting both the games’ settings, i.e. Colorado and the Italian Riviera in Horizon and Horizon 2 respectively - and the writing locations (San Francisco and Milan). I wrote them when I was car-less (but not necessarily care-less); when I was fully motorized; when I was a proud pedestrian; when I drove incessantly; when I did not drive at all, either in real life or on the screen; when I moved constantly while remaining motionless and when I remained static while traveling along the so-called "information superhighways". In recent years I have traveled tens of thousands of real/virtual miles/kilometers: this dual activity has stimulated both a critical reflection (EXTRA MILES and Orizzonti di Forza) and an artistic expression (Game Art). EXTRA MILES begins exactly where Orizzonti di Forza ended. Another way of saying this is that the point of arrival of Orizzonti di Forza and the starting point of EXTRA MILES coincide. EXTENDED PLAY, in a sense. RP: And what about your critical approach? MB: Discussing the philosophy of Ludologica in a speech given at Milan’s La Triennale museum in November 2014, I explained that studies of digital games usually pursue two strategies, which in turn have many ramifications. The first, mostly centripetal, is ludo-driven. Consider, for instance, intra-media studies in which the scholar examines the video game text as a videogame, i.e. as a specific autonomous object of study that requires an ad hoc set of hermeneutical tools. A variety of methods, ranging from semiotics to software studies, are used to achieve the goal, their common denominator is a focus on the case study, its sheer textuality. Included in this group are Auteur Studies, which examine a game in the context of a designer’s broader production (often her or his magnum opus), in order to identify signature styles, leitmotivs, recurrent situations, and mechanics. A variant are genre studies, in which the video game "X" is examined in relation to the conventions and cliches of genre "Y". There are plently of studies about first-person shooters or survival horror games, for instance. There are also inter-media or comparative studies in which a videogame is examined in relation to a contiguous cultural artifact, for instance a comic book, a novel or a movie. This approach is very common in the case of adaptations. A second strategy, trans-playful and mostly centrifugal, examines the relationship between the case study (i.e., a specific videogame) and society at large. This approach, which is located at the intersection of disciplines like sociology of culture, philosophy, and anthropology, is far less common in the context of Game Studies, because of its overt interdisciplinarity. Consider, for example, studies of anthropological nature applying ethnographic methods to describe the relationship between games and their players. In this case, the research does not aim so much to clarify the “functioning” of the game-as-text, but rather to explain the meaning of the game for its players, thus, for (a segment of) society itself. This approach shares Marshall McLuhan’s famous statement in Understanding Media (1964) according to which “[I] games are dramatic models of our psychological lives”. It also share theories of authors like Slavoj Žižek, Louis Althusser, Michel Foucault or Gramsci according to whom popular culture is never “neutral” or disengaged. According to these scholars, popular culture instead reflects, transmits and/or promotes a certain ideology, a specific weltanschauung. In explicitly philosophical analyses, a videogame often becomes a metaphor or allegory, symbol or symptom, epiphenomenon of broader/deeper cultural trends. The game is therefore a mirror that both reflects & distorts a certain reality. It is a map of a territory that often thinks itself of having a purely cartographic nature, hence the bias of the alleged congruence between reality and simulation. Reflecting on the popularity (or lack of thereof) of a particular video game can help illuminate some behaviors otherwise opaque. I find video games very helpful in understanding the dominant ideology in America, i.e., neoliberalism. Studying a game can also help us understand that our own subject position (e.g. acceptance/rejection/negotiation) is never casual or spontaneous, but rather, it is the result of a process of acculturation/learning/indoctrination. By “our own” I mean both the gamers and the scholars’. The critical question we must ask ourselves is whether a particular cultural artifact supports or subverts the status quo, can be regarded as mere propaganda or playful sabotage. Both Orizzonti di Forza and EXTRA MILES exemplify this approach. RP: One of EXTRA MILES’s key themes is the notion of realism. By putting this concept under the magnifying lenses, you begin to see many inconsistencies and aporias. Instead of summarizing your argument and sharing your conclusion, could you provide an example of a “real” realistic videogame? MB: Certainly. Consider Colorless, Odorless, and Tasteless (2011), an installation by Eva and Franco Mattes aka 0100101110101101.org consisting of a modified version of the classic coin-op Pole Position (1982) that releases carbon monoxide each time the player pushes on the accelerator. De facto, the operator/driver controls the flow of the invisible toxic substance produced by the game car’s engine (you see, there are game engines and there are "engines of games"). That means that the more you play, the more you inhale toxic gas. By killing its player slowly-but-surely, this interactive installation introduces an element of realism - the fact that cars pollute and destroy life, both human and natural - in an environment in which it has been expunged (since it is not part of the simulation). Thus, the “tasteless” part of the artwork’s title does not simply refer to the fact that carbon monoxide has no flavor, so to speak, but that it is also taste-less, that is, impolite (read: politically incorrect) for bringing forth the inherent contradictions and (v)ideology of the tools and technologies that we use every day, such as cars and videogames. Art produces a counter-discourse to advertising and racing games are nothing more that interactive commercials: their visual reference is the televised commercial more than movies, especially road movies. The racing game/commercial simply recreates an appearance of driving in which the main product of such activity, i.e. pollution and thus death, is completely erased. For this reason, the Mattes’ piece is much more realistic than the most advanced games on the market. Moreover, their work exemplifies the difference between artists and players. As McLuhan explains Through the Vanishing Point: Space in Poetry and Painting (1968), “The artist has the ability to discern the current environment created by the latest technology.” And “Art ceases to be a form of self-expression in the electric age. In fact, it becomes a necessary type of research and investigation.” Much has been written about the alleged “active player” who engages with the game as opposed to the “passive” spectator of a film who supposedly receives a predefined narrative. But the so called agency and activity of the gamer is a mere illusion. The artist, on the other hand, is truly active in deconstructing the game, its ideology, and the environment that it creates. In short, the artist is the real player. RP: What’s the point of driving in games? MB: In his timeless travelogue America (1989), Baudrillard writes that “Driving is a spectacular form of amnesia. Everything is to be discovered, everything to be obliterated.” This observation also applies to driving simulations, Forza Horizon included. The player drives to discover and to immediately to forget. The hypnotic effect of the road, the virtuality of ludic dromology, the sedentary aspect of such activity contribute to the erasure of time. When I want to relax, I get into my car and ride for hours through the streets of Grand Theft Auto V’s virtual Los Angeles, listening to a podcast or an audiobook, thus replicating the so-called "real" experience, for which driving and listening are inseparable. I tend to drive really slow, at “cruising speed”, in order to enjoy the carscapes. There is a beautiful project by French photographer Benoit Paillé entitled Crossroads of Realities (2014 ) that perfectly captures the feeling of going places and seeing things without really getting anywhere. And that’s what racing games are all about.